Are you people worried about learning Bihar? Then take the Bihar GK Quiz? Don’t worry you can a look at the below post, in which We will offer you Bihar GK Questions, that helps you to face different competitive exams. By the way, we also provide Bihar GK Questions along with the Answers. And you people need to answer those questions within the stipulated given time. Moreover, this post also contains Bihar General Knowledge Questions and Answers so that the aspirants can quickly look over their mistakes and can redress them. 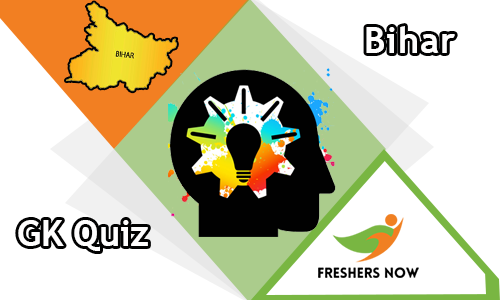 These Bihar General Knowledge Questions helps the candidates to polish themselves for facing the competitive exams. So, you people are welcome to take the Bihar General Knowledge Questions and Answers and practice them. 1. Bihar Diwas is celebrated? 2. When was the first Doordarshan center installed in Bihar? 3. Is Bihar the official language? 4. Is Bihar's state animal? 5. Total Number of Rajya Sabha seats in Bihar? 6. Who was the first Independent Chief Minister of Bihar? 7. Is the district of Bihar? 8. Who is the first person to receive the Jnanpith award? 9. Which of the following state is bordered south to Bihar? 10. The first time President Rule imposed in Bihar in which of the following years? 11. Which of the following district is most Populous in Bihar? 12. Who was the founder of the Bihar Provincial Kisan Sabha (BPKS) in 1929? 13. How many villages are there in Bihar? 14. Which year was founded in Patna University? 15. What is the number of college in Bihar? 16. Which of the following district of Bihar does not shares border with Nepal? 17. What is the rank of Bihar state (as per census 2011) in terms of population in the country? 20. Asia’s Biggest Cattle Fair held at which of the following city? 22. Which country is to the north of Bihar? 23. Which is the official language of Bihar? 24. During an emergency the Fundamental Rights of the citizens? 25. Lord Mahavira attained Nirvana at which of the place? Bihar is the Third-Largest state of India in population. It as Uttar Pradesh in the west, Nepal to the north, a northern part of West Bengal to east and Jharkhand to the south. It is divided by the River Ganges, which floods the fertile plains. Crucial Buddhist pilgrimage sites include Bodhi Tree in Bodhgaya’s Mahabodhi Temple, under which the Buddha allegedly meditated. In the state capital Patna, Mahavir Mandir temple is revered by Hindus. The Cheif minister of Bihar is Nitish Kumar. The formation of this state took place on 22 March 1912. Its HDI rank was 16th in 2010. In November 2000 the new state of Jharkhand was created from Bihar’s southern provinces. Bihar occupied a strong position in the early history of India. This state mainly focuses on Indian culture and civilization. About half of Bihar is under cultivation. There are three harvests in a year like bhadai, aghani, and rabi. Fruits and vegetables are grown extensively. Plants are important in the district in large towns. Chilies and tobacco are important cash crops. The rate for men is significantly higher than that of women. Government departments promote vocational and technical schools. Allopathic and Ayurvedic dispensaries serve villages. The state tree is Peepal, State Flower is Marigold, State Animal Ox, State Bird Sparrow. This Bihar GK Quiz makes the candidates know the topics they have mastered. Moreover, this Bihar Online Test directs their learning to other areas and spend less time on the topics they already know. As the timer is provided, the candidates can know the amount of time remained to answer. The amount of time needs to be managed can be quickly known by the results obtained. The results in the Bihar GK Quiz are obtained based on the responses that you have given on or before time. According to the results obtained by the candidates, one can maintain their confidence levels. For Furthermore details and updates, keep on visiting our website Freshersnow.com.